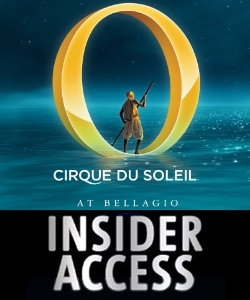 O by Cirque du Soleil - Cirque Insider Access discounts - Hotels Etc. Add a first-class touch to your Cirque du Soleil experience when you purchase the “O” Insider Access package. Along with the exclusive “Cirque du Soleil 25” CD, an “O” souvenir program, and an exclusive lanyard, you will get to go behind the scenes of the only aquatic show by Cirque du Soleil! Includes intimate backstage tour, exclusive premium seating, and much more! The Cirque Insider Access package is now available for guests who are looking for the ultimate, in-depth experience of Cirque du Soleil and the world famous production "O™". Come witness the #1 Show in Las Vegas and the show that has enjoyed sell-out performances for over 10 years with an exclusive and intimate backstage tour, premium center section seating, front-of-line access to the theater and concessions, exclusive Cirque du Soleil merchandise including the popular 25th anniversary CD: “Cirque du Soleil 25” and much more!